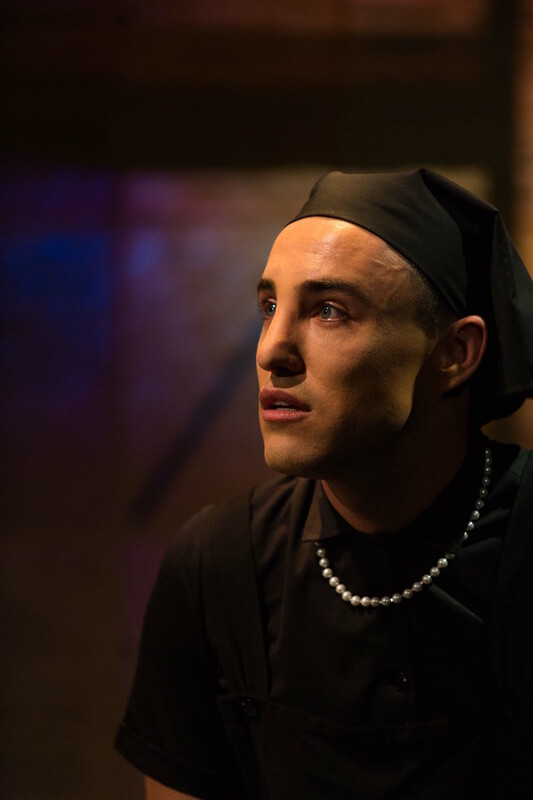 A riveting, finely honed performance from Ben Gerrard brigs equal balance to the entertaining and the thought-provoking aspects of the life of survivor Charlotte von Mahlsdorf in I Am My Own Wife. Born Lother Berfelde, German antiquarian von Mahlsdorf lived as a transvestite in East Berlin. Having endured Nazi Germany, von Mahlsdorf went on to live through the Soviet communist regime, relying not only on her wits, charm and ingenuity but also, in all likelihood, providing the Stasi (secret police of East Germany) with information. The final photographic image of Berfelde as a boy, not to be disclosed here, gives a chilling prophetic insight into the life that was to be lived alongside potentially terrifying enemies. The play begins with the fall of the Berlin Wall, the significance being that the subsequent freedom of tourism through Berlin allowed American writers to discover von Mahlsdorf and her Gründerzeit Museum. Playwright Doug Wright takes the unusual angle of including himself in the narrative, his excitement over the unfolding truth-is-stranger-than-fiction story shared with the audience as they experience it with him. Covering a range of incidents from throughout Berfelde/von Mahlsdorf’s life, Wright presents the gentle humour of the character to endear her to the audience before moving on to more salient and controversial aspects of her life. Wright clearly felt a degree of sympathy for von Mahlsdorf, tempering accusations of her role as an informant with talk of the inaccuracy of Stasi reports, the forceful nature of police interview techniques and the commonplace incidence of informants. Director Shaun Rennie guides our journey through this fascinating story with a minimum of visual stimuli, trusting the power of the script and the talents of sole actor Gerrard. 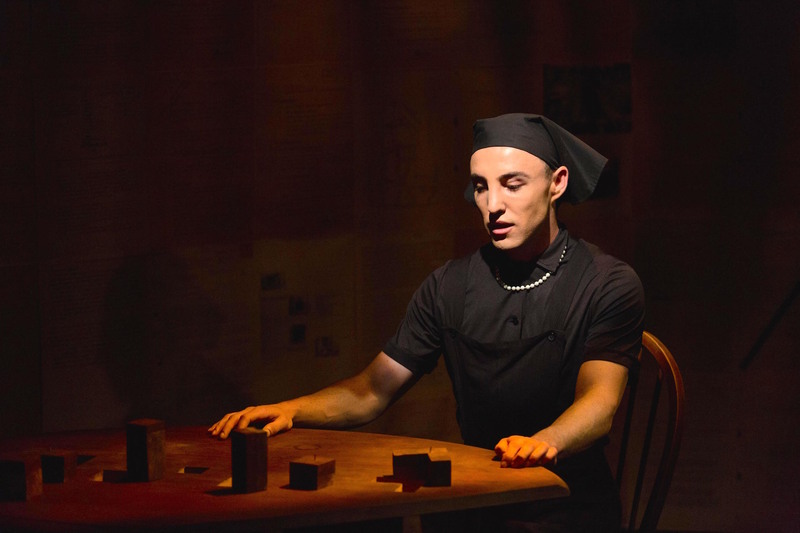 The intimate setting of fortyfivedownstairs allows close connection between actor and audience, and the clean simplicity of Rennie’s staging allows this connection to form quickly and successfully. Set designer Caroline Comino bases her design on the concept of interviews and paperwork, creating a rear wall from a multitude of redacted documents. Von Mahlsdorf’s treasures, usually portrayed by dolls house furniture, are represented her by small blocks of wood, ingeniously embedded into the table by set carpenter Joseph Scoullar. Lighting designer Hugh Hamilton helps to create an array of zones for the various chapters of the story using shafts of light at a range of angles. There are occasionally dark patches that impede full viewing of facial expression, but the effect is very atmospheric overall. 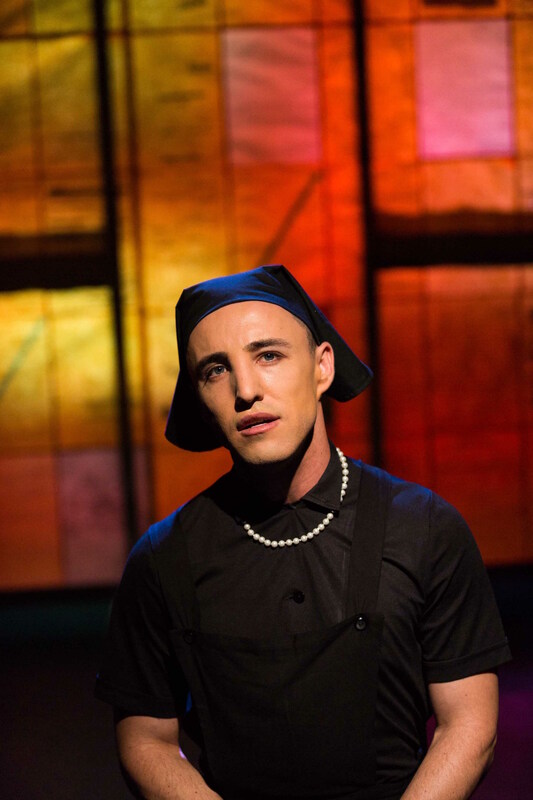 In an extraordinary performance, Gerrard not only vividly portrays some 40 characters but does so with seamless fluidity and gently understated charisma. Gerrard brings the audience to him, eschewing any type of showy bravura. The success of Gerrard’s performance lies not just in the mastery of accents of the characters, but in the associated range of facial, physical and vocal expressions of each character. For example, many characters speak in German or with German accents, and Gerrard finds subtleties in vocal patterns to differentiate each of these. Inspiring and engaging, I Am My Own Wife is a timely and well-produced piece of theatre. I Am My Own Wife plays at fortyfivedownstairs, Melbourne until 5 February 2017.